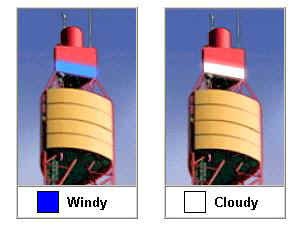 There are other problems with the weather tower. First of all, you have to remember what the colors mean, and that probably necessitates a chart in your car. "Is the color white? What does that mean?" Secondly, you see the tower from one of the busiest parts of I-80 entering Sacramento, and quite frankly there are other things I should have my eyes onlike the big semi on my right, which is about to topple over on top of me. And finally, even if I really wasn't sure if it was 60 degrees out or 100 degrees, or whether it was sunny or rainy, and even if I had studied up and memorized which colors mean which weather, and even if somehow I could drive safely while looking off to my side to check the weather tower, the damn thing is so faint you can't make out which color it is anyway. 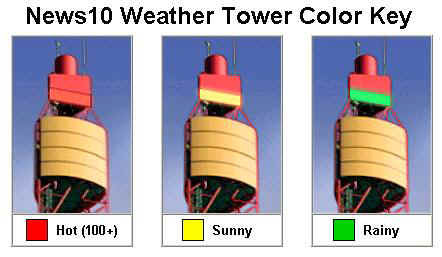 I sincerely hope this quite expensive (or so the promotions would have you believe) weather tower has some other function than to just let people know whether it is hot or not, whether it is windy or not, whether it is sunny or rainy. There are some signs which make some sense. I do rely on Smoky the Bear to tell me what the potential fire danger is. I can pretty much figure out that if it's raining the fire danger is low and if we are in the middle of a drought, surrounded by dry timber, and the temperatures are in the 100s, that the fire danger is high. But if I were the sort who liked to tromp out in the woods and rub two sticks together to make fire to cook my dinner, it might be nice to know if the in between weather conditions were high or not. I suppose. But now our government has come up with yet another way to keep us on the alert. Homeland Security Czar Tom Ridge has developed a color-coded alarm system to let us know how strong is the danger from terrorist attacks. Presumably now gone will be the "we heard something, so be on the alert for... something... somewhere... sometime in the next few months or so," and in its place we have colored alerts. Green represents "low" alert, Blue means a "general" risk of terrorist attack. Yellow means an increased, "significant" risk of attack. Orange means a "high risk" of terrorist attack. Red indicates a "severe" alert. I want to know where these alerts are going to be displayed. Is this purely a naming thing? Or is our local news station going to add another level to its weather alert? Will we now have to not only determine if it's rainy, but if there is a severe risk of terrorism as well? "Let's see, Martha--it's either sunny and no risk of terrorism, or it's raining and we'd better take cover quick." I suppose it's nice that we have agencies that will take care of us and warn us about weather and fire danger and terrorist potential. But I think I liked it better when I stepped outside to see what the weather was like and I went about my business, innocently realizing that there was nothing I personally could do about a potential terrorist attack, so I might as well enjoy the day.